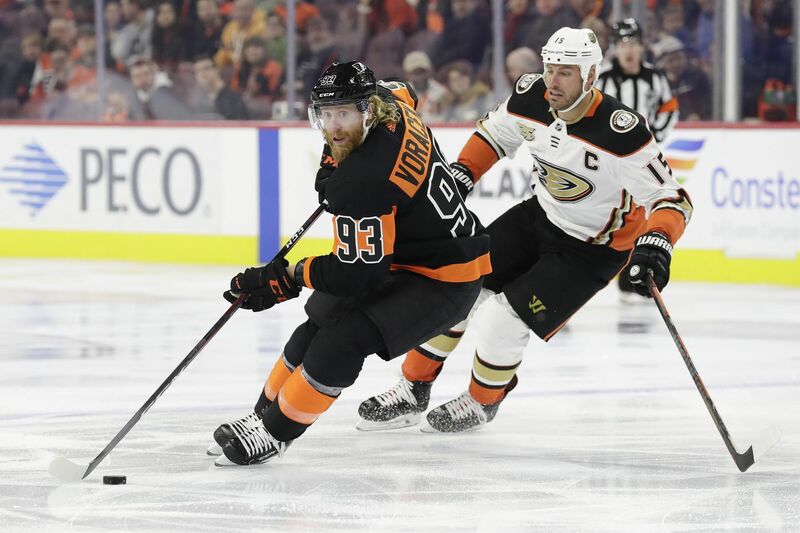 Flyers right winger Jake Voracek, skating past Anaheim's Ryan Getzlaf on Saturday, is part of a line that has a combined 30 points and a plus-23 rating in the last nine games. A little less than a month ago, Monday’s game against visiting Pittsburgh didn’t figure to have much meaning to the Flyers, who were 18 points behind the Penguins on Jan. 13. That was then. This is now: The Flyers, on a 9-0-1 run, have climbed to within six points of the Pens, who hold the Eastern Conference’s final wild-card spot. “We have to treat this like a playoff game,” Flyers interim coach Scott Gordon said after Monday’s morning skate in Voorhees. The Penguins are 28-20-7, while the Flyers are 25-23-7. Voracek said the Penguins have “the best one-two punch in the league” in centers Sidney Crosby (62 points in 52 games) and Evgeni Malkin (55 points in 50 games, minus-18). Malkin took part in the Penguins’ morning skate and surprisingly was on a line with Nick Bjugstad and Phil Kessel. He has missed the last five games with an undisclosed upper-body injury and hasn’t been able to take contact in any practice while he was sidelined. The Penguins said Malkin would be a game-time decision, but based on this morning -- he was also on the power play -- it appears he will play. For the Flyers, the line of Sean Couturier centering Oskar Lindblom and Voracek has been on a roll recently, recording a combined 30 points (13 goals, 17 assists) and a plus-23 rating in the last nine games. “At home, we’ve been playing the top lines and haven’t been scored on in quite a few games,” said Voracek, whose team hasn’t been on the ice for an opponent’s goal in the first four games of the homestand but will be tested Monday by Crosby and Co.
Carter Hart, who has a 2.45 GAA and .926 save percentage in 17 starts, will try to become the first goalie in NHL history to register nine straight wins before reaching his 21st birthday. Matt Murray (2.97, .909) will start for the Penguins. … Crosby (94 points in 64 games vs. Philadelphia) and Malkin (68 points in 54 games) have been Flyers killers in their careers. Giroux (46 points in 45 games) and Voracek (37 points, including 19 goals, in 37 games) have excelled against the Pens. … Pittsburgh defenseman Justin Schultz and center Zach Aston-Reese will be sidelined tonight. … Gordon was an assistant under Penguins coach Mike Sullivan for one season with Providence in the AHL in 2002-03. ... Negotiations with Flyers winger Michael Raffl, a potential unrestricted free agent, are not progressing. Raffl would like to remain here, “but at the end of the day, it’s a business and you never know” what will happen, he said. Raffl, a one-time 21-goal scorer, has a $2.35 million cap hit this season.